The movie follows Peipei. She is a 16 years-old high-school student, living in China but commuting to Hong Kong every day,where her school is. Peipei comes from a seemingly unstable household, and from an unprivileged background. She is best friend with Jo, her well-off classmate. They both dream and plan on going to an onsen, Japanese hot spring, in the winter. Jo starts dating Hao. That’s when things begin to get complicated. The teenager gets involved in Hao’s side-job and starts smuggling iPhone to mainland China. 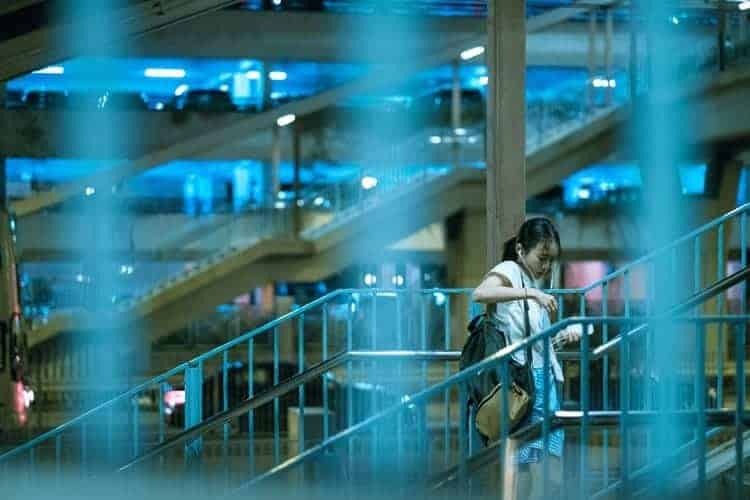 If she does it to gather enough money for her Japanese trip in the first place, the film unfolds more complex and subtle reasons. Indeed, Peipei involvement in illegal activities is not just linked to her desire to go abroad with her best friend. Her need for money also translates a desire to climb up the social ladder. Her involvement with the smuggling is also a way for the teen to be part of a gang, to belong. Moreover, Sister Hua (the team’s leader), fills in the character’s search for a mother figure. Finally, Peipei’s loyalty and growing feelings for Hao add up to the youngster’s motivation. What is very impressive and enjoyable in Bai Xue’s feature is that all characters are nuanced. The view is clearly not Manichean when it comes to the student and the people that gravitate around her. No one is a hundred percent good or bad. The director loves her characters, and it shows. As a result, the viewers can be empathetic to all of them. If Peipei’s mother seems mostly uninvolved in her daughter’s life, she is also a child-like figure and really loves her child. Hao is not just a bad boy with a big heart. He is sometimes a total idiot, sometimes a caring human being, and mostly a struggling man. Jo could be a superficial girl with no depth. She is not. She may be facing different issues and have a naive side, but she is as lost regarding her future as Peipei. And she is a very caring friend. That is why the main character’s “betrayal” is even more painful. The two girl’s friendship is actually central to the movie, which is one more reason to enjoy “The Crossing”. It feels good to see strong female friendships on screen. The strong and nuanced characters would not come to life if it wasn’t for the actors’ performances. Huang Yao (Peipei) actually won a well-deserved best actress award at the Pingyao International Film Festival. Carmen Soup (Jo) and Sunny Sun (Hao)’s acting is impeccable and make their characters relatable. Bai Xue’s first feature is not only enjoyable story-wise and characters-wise, but it is also cinematographically interesting. The real-life-like effect is enhanced by the natural lighting. Most close-ups slightly change the established conventions as the characters’ faces are cut half through and don’t take up the whole shot. In conclusion, “The Crossing” is definitely a movie worth-watching. It is even more impressive as it is Bai Xue’s first movie. This gives us high hopes for her future work (no pressure, though).